This recipe was originally published on November 22, 2015 and republished on September 28, 2018 with improvements to the recipe, updated content and photos. With the arrival of fall, you might be asking yourself, “What can I make with apples?” Have I got the recipe for you! It’s my mom’s Torta di Mele – her easy apple cake, aka the best apple cake ever! Over the years, I have made slight modifications to make this fresh apple cake recipe a little healthier. It continues to be a family favorite. I love easy apple recipes, which is why this Italian apple cake – much like these Apple Pie Muffins – can be prepared with just two bowls. The most time-consuming part in this recipe is dicing and slicing the apples. 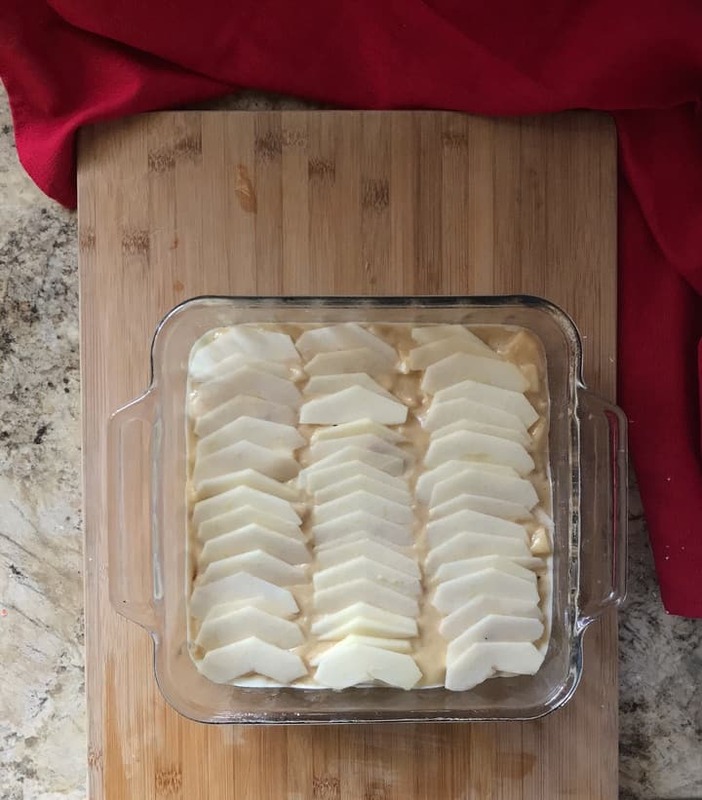 Depending on how much time I have, sometimes, I will top off the cake with diced apples, and sometimes I will use thinly sliced apples. Both make a lovely top crust. 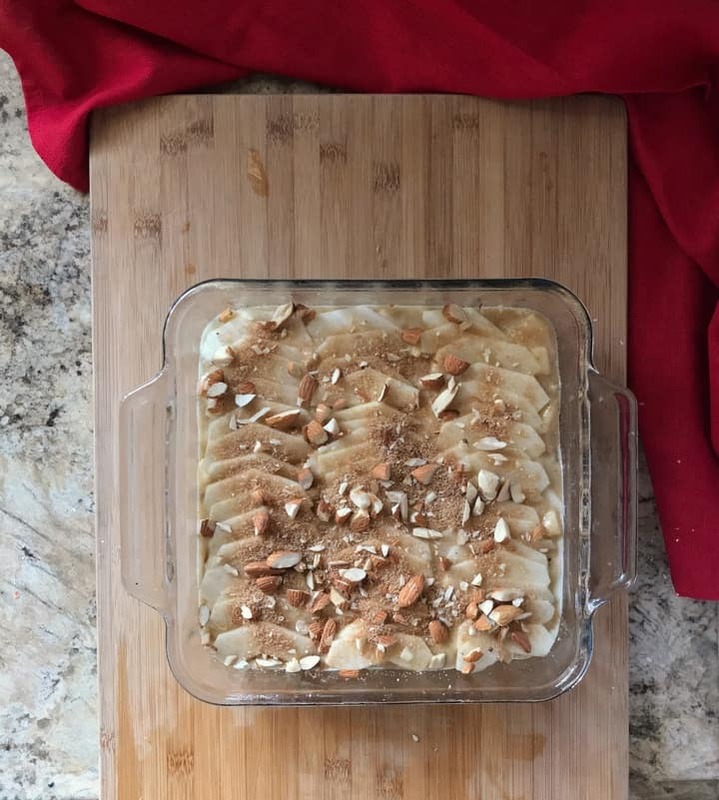 What do I Need to Make this Almond Apple Cake? Brown sugar and cinnamon. Who doesn’t love a cake topped with these? go on the topping as well. Dry ingredients. Flour, baking powder, salt. Sugar. Just a little – the apples provide a lot of sweetness too. Wet ingredients. Eggs, vegetable oil, applesauce, and vanilla extract. Apples. In case the name didn’t tip you off! 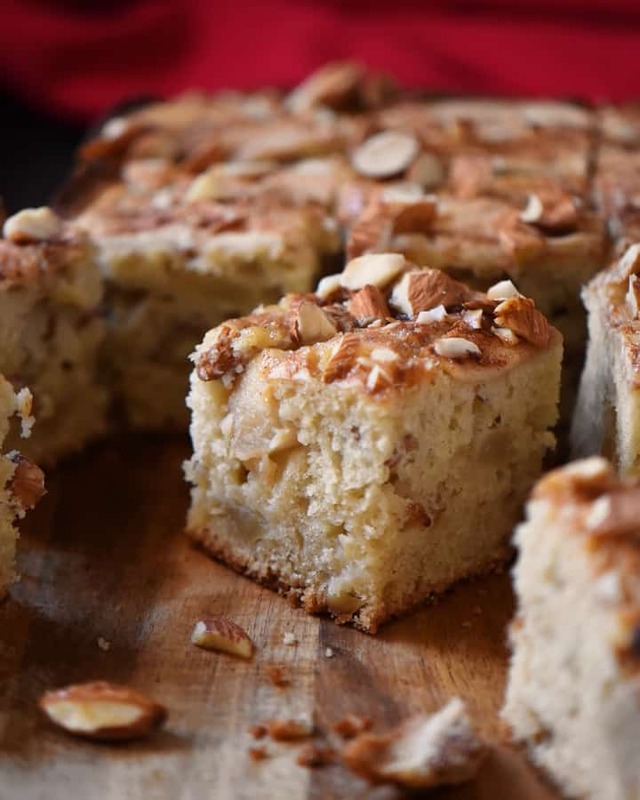 Appliances needed to make this almond apple cake are quite minimal. 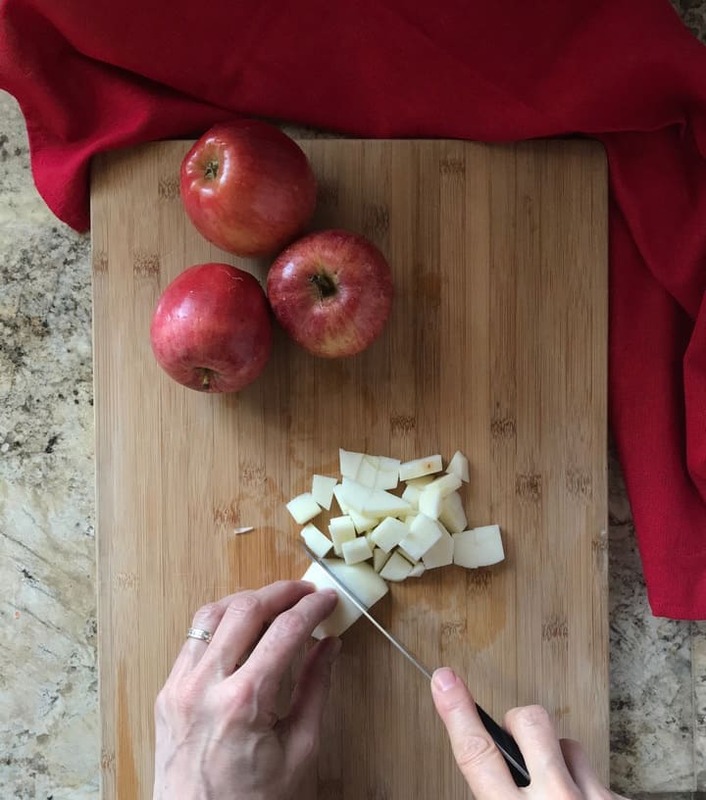 You’ll need a 9 x 9 square pan, a whisk, a wooden spoon, two bowls, and a good knife to chop up the apples. Apple dessert recipes usually come together pretty easily, and this one is no exception. How to make Apple Cake? It couldn’t be easier! The first thing we are going to do is prepare the nut topping. Simply combine the almonds, brown sugar and cinnamon and set it aside while we get started with the rest of the ingredients. In another bowl, sift the dry ingredients together and set them aside. In another bowl, we are going to combine all of the liquid ingredients. Begin by whisking the two eggs together. Whisk the eggs until they are light in color and begin to thicken. Gradually whisk in the sugar, followed by the vegetable oil and finally the Chunky Applesauce. Just in case you are wondering, you could use your stand mixture for this recipe. Personally, I find it easier to use a couple of bowls and a good old-fashioned whisk to beat the ingredients together. It’s time to start dicing and slicing some apples. 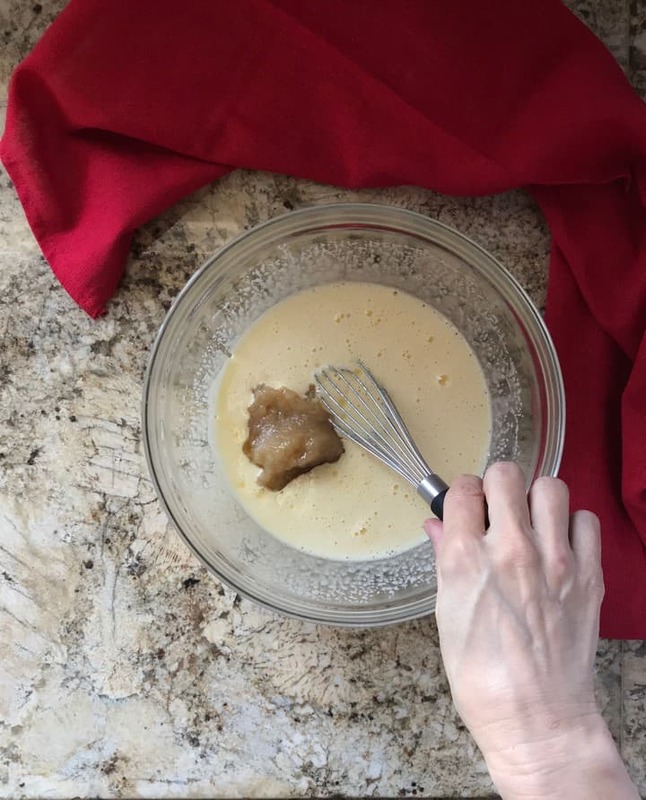 The three apples that get diced will go in the batter and the one apple that will get sliced will be placed on top of the batter. Today, I decided to use McIntosh apples. Cortland apples are another great choice for this apple cake. In fact, feel free to experiment and use different varieties of apples. Try to dice your apples uniformly so that they cook evenly. As far as the size is concerned, dice 1/2 inch or smaller. Remember that nut mixture we prepared a few minutes ago, remove about three tablespoons. This will be the final touch to this apple cake as it will be sprinkled over the top. 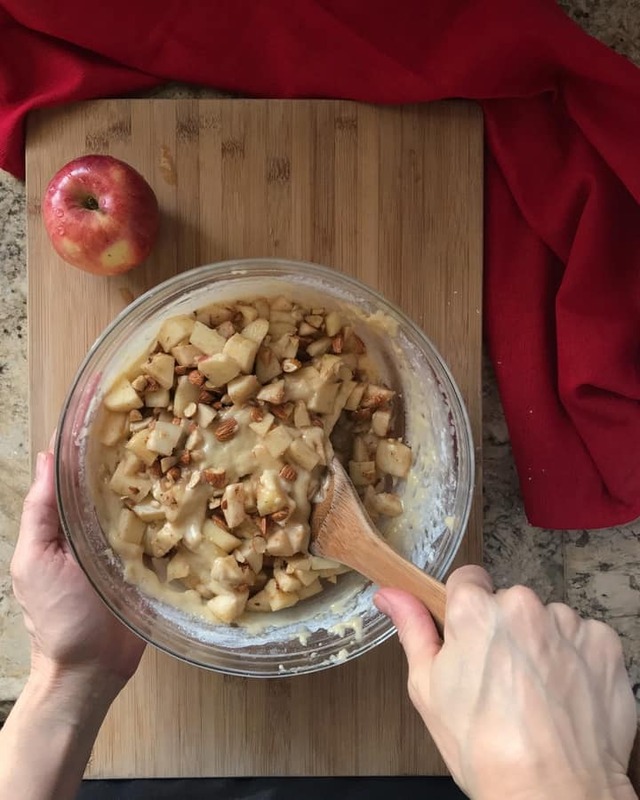 Combine the rest of the nut mixture with these diced apples. Next, add the dry ingredients to the wet ones and combine together. Do not over mix. Add the diced apple/nut mixture to the batter and gently combine together. Surprisingly, there isn’t a lot of batter for the amount of apples. But the magical ability of apples to release moisture really works in this recipe. And what is even more magical about this apple cake – it becomes moister the second day around (if it lasts that long). Perhaps I should have called this recipe a Moist Apple Cake! Once the batter has been poured in a 9 x 9 greased square pan, top with that fourth apple that has been thinly sliced. Finally, top with the reserved three tablespoons of nut mixture. In the oven it goes for about forty-five minutes. 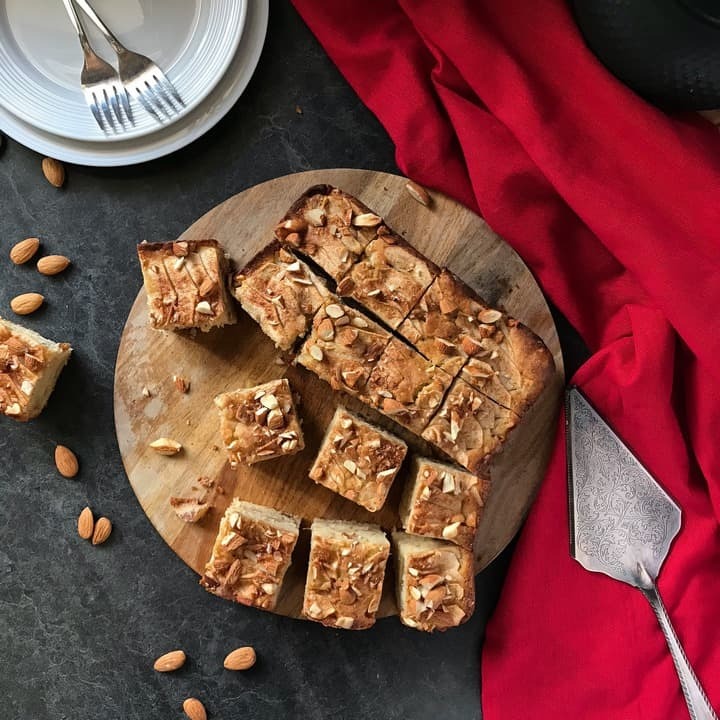 These apple squares can be served warm or at room temperature and because they are not overly sweet they are great at any time of the day. Apples are used throughout the world in desserts by lots of different cultures; take, for example, apple streusel, polish apple cake, apple pie, apple bar recipes with fresh apples… to name but a few. So many wonderful desserts! Just for fun I googled apple cake recipes and I got 10 million hits. Then I googled best apple cake recipe and I got over 13 million hits. How could there possible be that many best apple recipes, right? Then I started to think about what defines a recipe as being the best. It goes without saying that your final product has to taste good. But if the recipe is associated with a wonderful memory, well, that would make it the “best” recipe as far as I am concerned. Sifting the dry ingredients together will allow for better distribution of all the individual ingredients throughout the dry mixture. The process also aerates the dry ingredients making the final product lighter in texture. This homemade apple cake could also be called Healthy Apple Cake as part of the vegetable oil is replaced with applesauce; uses a minimal amount of sugar; and there is no butter in the recipe. Almonds can be omitted if there are nut allergies in your household. Can I freeze this cake? Yes, this moist apple cake recipe freezes wonderfully. Can I use a bundt pan? Yes, this recipe makes the perfect apple bundt cake! What are the best apples to use? If you like McIntosh apple recipes, this is the perfect recipe. My mom would make this old fashioned fresh apple cake recipe a few times a month, usually as the dessert following the traditional Italian Sunday lunch (you know the one that lasts three hours and gathers about 15 people around the table). In fact, she would often alternate between this recipe and her Ciambella recipe. She would verbally refer to this cake as la torta di mele ebrea, or Jewish Apple Cake. When my mom immigrated to Canada, she worked a few years in the manufacturing industry, along with a few of her sisters. If my memory serves me right, one of the ladies that worked with them was of Jewish origin. She shared her recipe with one of my aunt’s, who in turn shared it with my mom. I’ve added a little vanilla extract. As far as the almonds are concerned, combine them with cinnamon and brown sugar in order to create a little crunch. 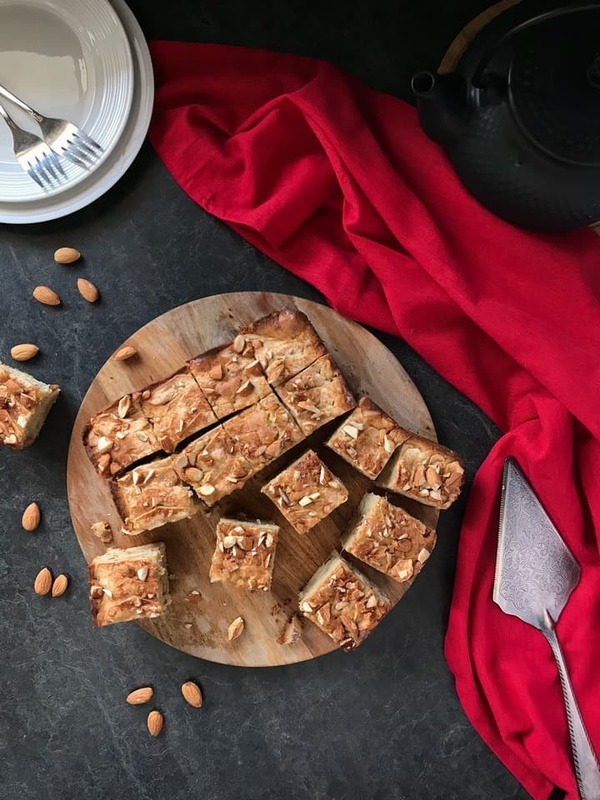 This modified version of my mom’s Almond Apple Square Cake is one of is one the best apple cake recipes you can make, especially in the autumn. It’s one of those cakes that actually tastes better the next day. Super moist with just the right amount of sweetness. You really need to try it! 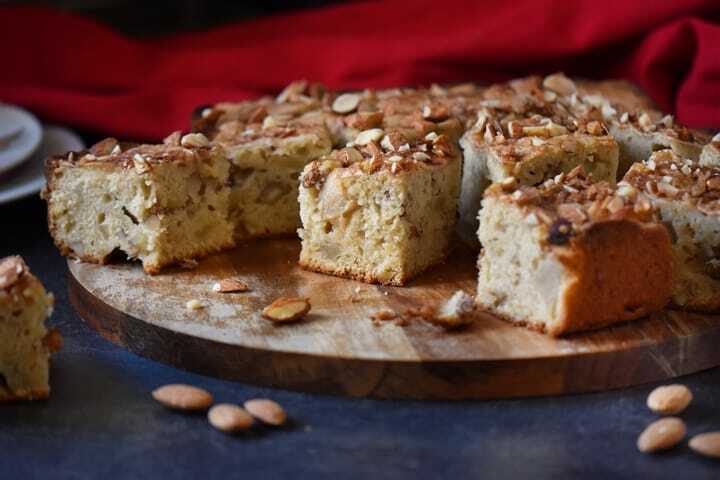 ★★★★★ If you have made this Almond Apple Cake recipe, I would love to hear about it in the comments below and be sure to rate the recipe! 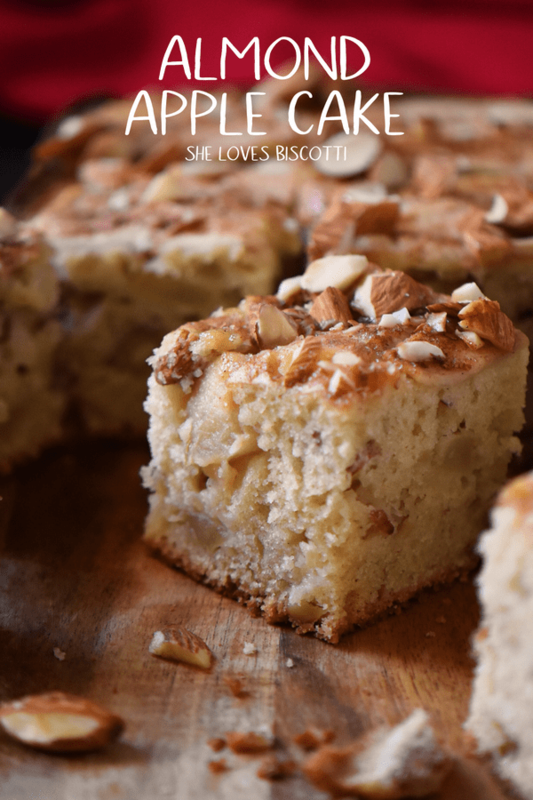 This Almond Apple Cake has magical abilities... it tastes better the day after it is made! Grease and flour (or use non-stick spray) a 9 x 9 square pan. Set aside. Prepare the nut topping by combining almonds, brown sugar and cinnamon. Reserve about 3 tablespoons of this mixture to spread on top of cake. Set aside. In a separate mixing bowl, sift together flour, baking powder and salt. Set aside. In another bowl, whisk the eggs together until light and frothy. Add the sugar and continue to whisk until thick. Whisk for about 2 minutes. Add the vegetable oil, applesauce and vanilla extract and whisk together for about a minute or so. Set aside while we chop up the apples. Combine the diced apples to the nut mixture and set aside. Add dry ingredients to the wet ingredients and combine with a wooden spoon. Do not over mix. Gently combine the apple mixture. Pour batter into greased 9 x 9 pan. Place thinly sliced apples firmly on the top. Sprinkle reserved 3 tablespoons of nut topping. Bake in preheated oven for 45-50 minutes until golden and cake tester comes out clean. Transfer pan to a rack where it can cool down for about 15 minutes. This cake could also be called Healthy Apple Cake as part of the vegetable oil is replaced with applesauce; uses a minimal amount of sugar; and there is no butter in the recipe. Do you use butter in any of your baking? Simple, straightforward and I am certain wonderful to snack on! 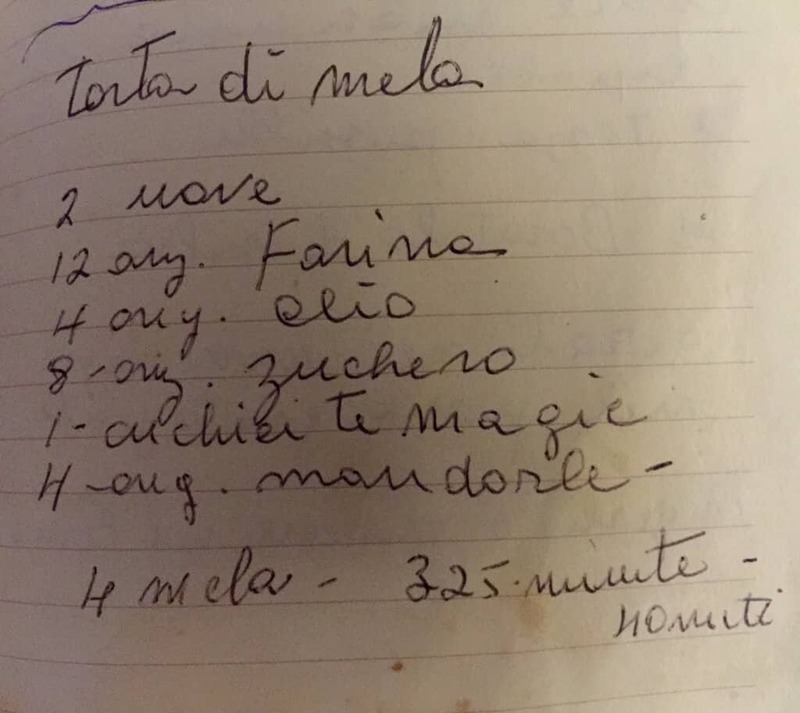 That apple cake looks delicious, but seeing that recipe of your mom’s in Italian is priceless. This must taste wonderful, with all those memories it evokes. I made this cake today. followed the recipe as written except for one thing. I didn’t have any vege oil, so I used a combination of barely melted ghee and coconut oil. My adult daughter and I couldn’t stop nibbling on it because it is simply delicious! I might just end up making it a couple of times a month too! What a great variation Anne! I must try it! Thanks so much for taking the time to share… I am so happy to hear you enjoyed this apple cake. Have a wonderful day! Wonderful post Maria! I love recipes like this that evoke beautiful memories! Made it for Christmas and everyone was delighted by it. Thanks for another wonderful recipe, Maria. It looks FANTASTIC, and I’m definitely going to try it. We also love apple desserts…hope you enjoy this one!